In other news of the garden this spring, I've noticed that the early bloom phenomenon continues. Catalpa speciosa trees are blooming now with big, white ruffly blooms that are usually so high up from the ground that they just look like popcorn from afar. 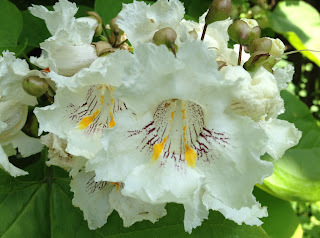 But when you slow down to take a closer look, the catalpa blooms look rather exotic, like something from the tropics rather than something one finds in an Indiana garden. I think they are blooming a few weeks earlier than normal. These blooms are not in my garden by the way. Catalpa trees get very tall and are too big for my garden. Also to be filed under exotic is the reappearance of a pileated woodpecker in the neighborhood. This time, he was tapping on my sunroom window. Whatever could he want? His picture on a blog post, again? He's not going to get much food from tapping on aluminum clad windows. But he did get his picture posted on another blog post. I'm here to please the birds, apparently. Your Catalpa speciosa blooms are lovely. Our feathered friends can be quite amusing. I remember about 7 years or so ago a mother chickadee insisted on tapping on our bedroom window at 5 am in the morning...with no distinction between weekdays and weekends...arrhhh! I am experiencing the same phenomenon with my vegetable plants. None of them are completely mature and yet they are all setting blooms. Could this be because of the very hot summer we are experiencing or due to the global warming. I haven't seen that woodpecker here this year but indigo buntings were flocking although they are camera shy. Silly bird pecking metal. He just wanted your attention perhaps. Oh, and we're uber early too. Our catalpa is blooming too. They are a gorgeous tree. I am always surprised that more people don't grow them if they have the room. That woodpecker is attracted to someting in your garden. Do you have ants? Maybe he/she was after them?? Great photos. P.S. 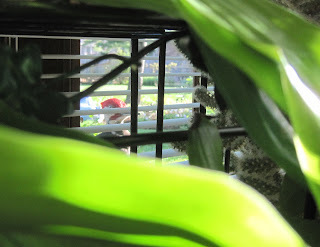 Maybe the Pileated is seeing himself in the reflection and doesn't want to share his territory with the interloper. What a gorgeous bloom. I haven't come across a Catalpa before but it is very lovely.